What�s the Best Study Strategy for You? The most important step to increasing your ability to learn is to become aware of how you learn. Try to monitor your thoughts and feelings while learning. Then try to use a study strategy that best fits with your learning style, or combine the strategies if you feel you have more than one learning style. Remember that the goal is to apply the ideas you have learned to new situations. You enjoy writing, reading, telling stories, doing word searches or crosswords. Create stories using the ideas to be learned, for example write a science fiction story or a detective story incorporating the ideas. Summarize key concepts and their supporting evidence. Flashcards may help recall definitions. For example, you might write a science fiction story in which an electromagnetic interaction is used and explained within the story. Remember to support claims made in the story with evidence. See for example the stories in Chronicles of the Wandering Star. You are interested in patterns, categorizing things, relationships between things. You like math problems, strategy games, and experiments. A coil of wire with an electric current going through it exhibits magnetic properties. A current is produced in a coil of wire in a closed circuit when a magnet is moved in and out of the coil. a. An ammeter attached to the circuit deflects. You think in images and pictures. Often fascinated with mazes or jigsaw puzzles, drawing, building things with interlocking blocks, daydreaming. Focus on the learning objectives, for example the key questions of each activity or the key cycle question for each cycle. Close your eyes and try to visualize how answers to the activity key question connect to the cycle key question. Create a map of the ideas and how they are connected, for example a concept map. Practice applying ideas to new situations. Practice using the simulator. Draw pictures, charts, and/or graphs to assist in your understanding. 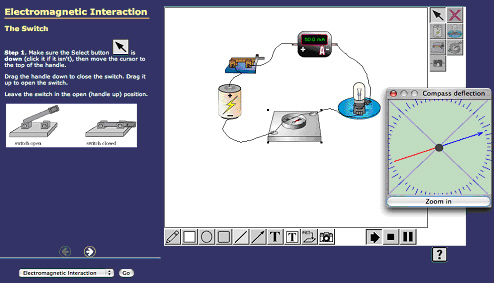 For example you might use the simulator to explore the electromagnetic interaction by observing what affect more batteries or more loops may have on the deflection of a compass needle in a closed circuit. You like to sing or tap out a beat. You are very aware of sounds and are usually a discriminating listeners. Write a song using the key ideas being learned � either create your own music or paraphrase a song you know well and then sing it! Try to include connections between ideas and supporting evidence for ideas. Create rhymes with rhythmic cadences using the ideas. Listen to music without words while you are studying. And transverse waves, up and down, hey! You may be athletic, a good dancer, or good at crafts. You process knowledge through bodily sensations. Schedule when you study. Act things out when possible. Find real life examples. Construct models and maps. Use the simulator. For example you could create a dance that describes different types of chemical bonding. You could create a performance that depicts the interaction between a swimmer and water using people for the water and the swimmer. You are good at communicating and seem to understand others� feelings and motives. Work with someone. Discuss ideas with friends. Teach someone the ideas. Create a study group. For example you might want to teach a friend about the electromagnetic interaction. You are very aware of your own feelings and are self-motivated. You are often shy. Keep a journal about what you are learning. Find a quiet place to study alone. Create your own individual project. For example you could design your own scientific investigation exploring the motor answering questions such as: if you increase the number of turns in the coil of a motor how will that affect how rapidly the motor turns? You�re interested in nature. You are able to identify patterns and classify things in nature. Try to apply the ideas to natural settings. Study outdoors. For example you might calculate the average speed of a bug as it moves across the grass or study the mechanical interactions between an animal and an object in its environment.